My knowledge of shark teeth fossils is very limited so finding this Internet site in Japan is a real treasure: J-elasmo by Dr. Fumio Nakagawa (Ota-ku, Tokyo). It is good to set objectives and two of my current ones are: 1) find a Troosticrinus blastoid and 2) collect a Mississippian Period shark tooth. This web site can help with the second objective in providing images of what to look for and which layers to find the fossil. Wow, the collection of Indiana and Kentucky Mississippian Period shark teeth is impressive! Three web pages on the site were of particular interest. 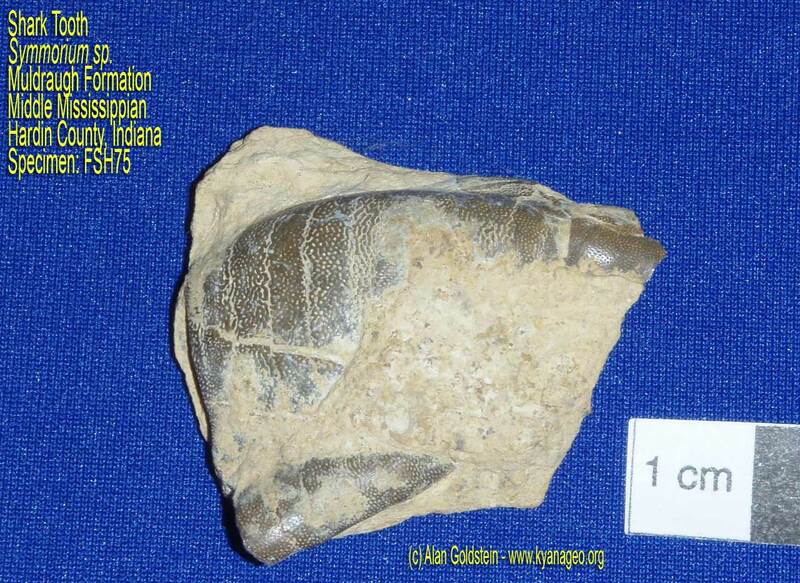 Mississippian Period fossil teeth found in three Indiana locations on this page. The first site is in Washington County, Indiana in the Harrods Limestone Formation with Symmorium, Hybodus, Orodus greggi, Petalodus, Polyrhizodus, Lisgodus, Chomatodus multiplicatus, Helodus, Deltodus, Lagarodus, Venustodus argutus, and Phoebodus specimens being found. Site 2 is also in Washington County, Indiana in the Salem Limestone. Specimens found there are: Chomatodus, Antliodus, Campodus, Sandolodus, and Psammodus. Site 3 found in Washington County, Indiana in the Haney Limestone Formation. Specimens Symmorium and Chomatodus being found. 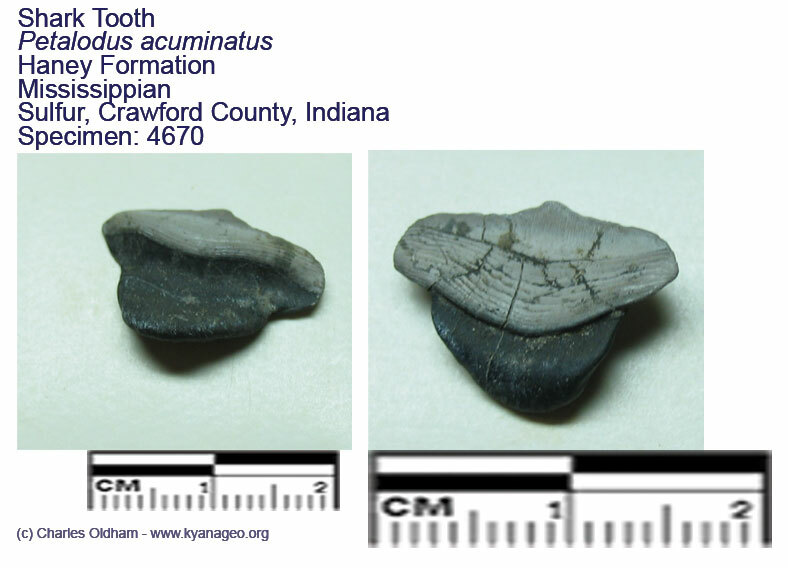 The next web page lists more Upper Mississippian Period shark teeth but this time from Crawford County, Indiana. Specimens found in the Haney Formation: Symmorium, Hybodus, Orodus, Campodus, Petalodus, Fissodus, Tanodus polymorphus, Helodus, Sandolodus carbonarias, Psammodus, and Venustodus. Found in the Indian Springs Formation: Symmorium reniforme, Antliodus, Arpagodus, Venustodus argutus, Petrodus, Sandlodus, and Deltodus. The last web page is of Middle Mississippian Period sharks teeth found in Hardin County, Kentucky. 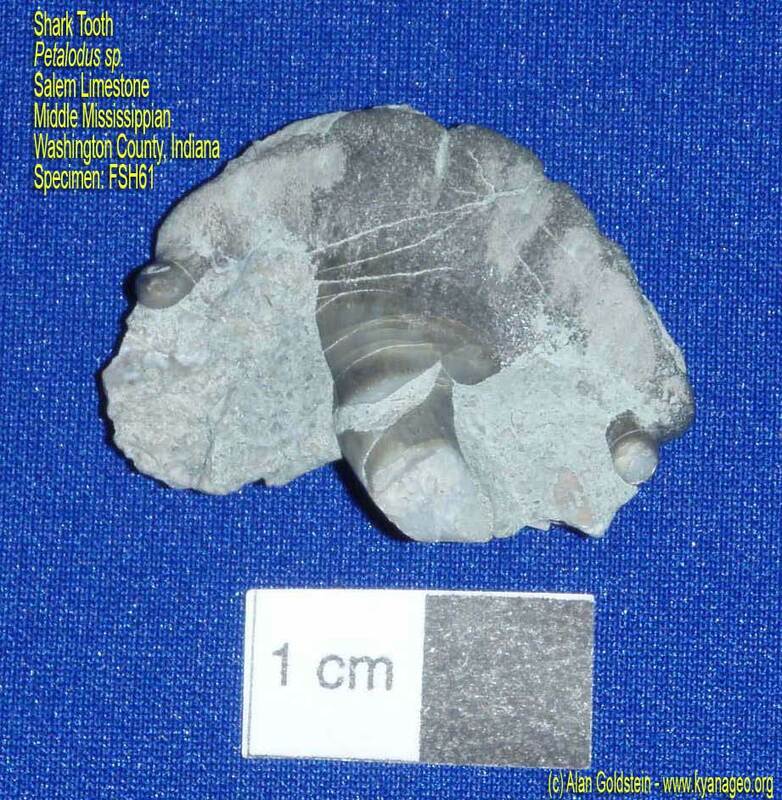 These teeth were found in the Salem/Harrodsburg Limestone. 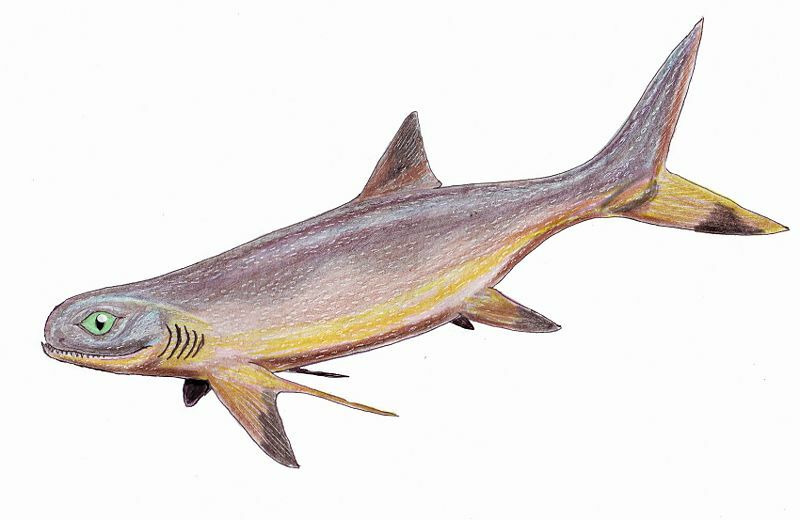 Identified as Campodus, Hybodus, Orodus, Phoebodus, Chomatodus multiplicatus, Helodus, Sandolodus, and Psammodus. 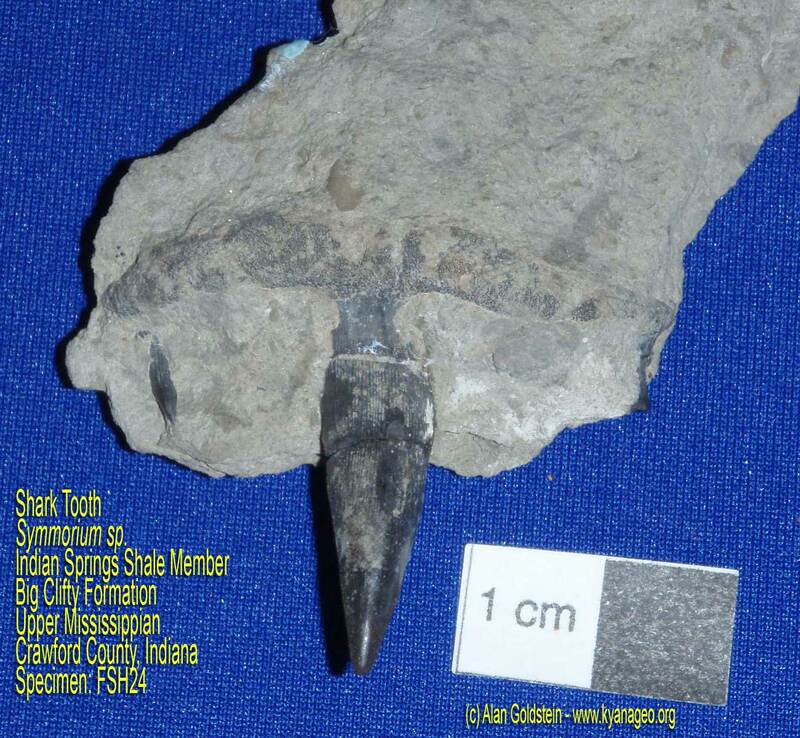 This website is a treasure trove of pictures of fossil sharks teeth found in Indiana and Kentucky. Those images represent just a small fraction of the information about sharks on this impressive web site.